Robbie Smart did a social media takeover on our Snapchat and Instagram account for #Talented. We thought we should get to know him a little bit better and find out what links his generosity to his talent! So Robbie, tell us a bit about yourself? 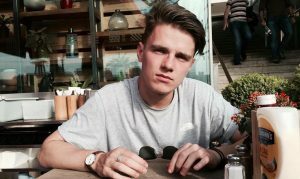 I’m 21, live in South West London, and have done for 2 and a half years. I moved here after a gap year as I’d decided not to go down the university route. I started with an internship at St. Michael’s Church doing children’s work, alongside doing the New Wine Discipleship Year. After that year I started working part time for St. Michael’s, and also part time for a Christian charity that provides P.E. provision and mentoring in schools called Kick London. So you work for a church and for Kick London?! What exactly is Kick London? Kick London is a charity who’s vision is to see young people’s lives transformed through sport. We work with young people, combining sport and life skills, all underpinned by Christian values. We essentially go into schools and provide national curriculum P.E. provision or mentoring for the young people, all the while using our Christian faith to share the gospel to these young people. What made you combine your love of football to then helping people with it? I’ve always loved football and all sport in general, but sadly I realised that I wasn’t going to make it as a professional sports man. So instead, I decided to going into coaching and teaching. What’s that old saying ‘those who can’t do, teach!’ Kick is the perfect job in which I get to share my passion for sport and my passion for Jesus. How have you seen you using your talent benefit others? It’s not so much a ‘talent’ but I just love and am passionate about sport, and I really hope that in demonstrating that love for the kids, I can help them to fall in love with sport too! I love seeing children who are shy or have no confidence grow a love of sport and enjoy doing it as much as I do. What inspires you to remain being generous with your talent and your time? I think part of working two jobs for two different organisations is making sure you are generous with your time, otherwise I wouldn’t be able to keep on top of them both. I guess when it comes to the grand scheme of things, the way I get to share my faith with other people and children in particular is incredible, so it makes it very easy to get up in the mornings! Why do you think the world needs generosity at the moment? In a society where every advert or billboard seems to be broadcasting some sort of selfish message, I think us all having a little bit more generosity and putting others before ourselves wouldn’t be a bad thing! If you could leave one bit of advice for those who want to use their talent to be generous, what would it be? My main piece of advice would be make sure you use your talents! Our talents are God given and I like to think He loves nothing more than seeing His children use the gifts He has given us. I’m so lucky to be in two jobs where I get to use my talents and share my faith too, but I would just tell you to find a way, whatever it may be, to use the talents God has given you! If you want to hear more from Robbie, then you can follow his Twitter (@robbie_smart) or his Instagram (@robbiesmart_). You can also find out more about Kick London by heading to their website http://kicklondon.org.uk/.